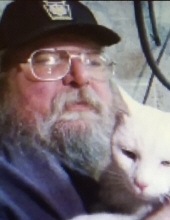 Stephen John Chovanes 67, of Leechburg, passed away February 2, 2019 at Allegheny General Hospital in Pittsburgh with his loved ones by his side. He was born July 18, 1951 and the son of late Stephen and Anna (Mrasz) Chovanes. Steve was a graduate of Kiski Area High School and St. Vincent College earning a degree in Psychology and Sociology and a Veteran of the United States Army. He worked as a teacher, a truckdriver for United Refinery, and was self-employed with his own construction business, "Chovanes Construction". His true passions were farming, the outdoors, collecting tractors, planting his porch gardens and spending time with his cats Susie, Blackie, and Sassy. He is survived by his companion of 28 years Bonnie Butler of Leechburg, two sisters Kathleen Uncapher of Leechburg and Michele (Tony) Dicenzo of Pittsburgh, a brother John (Eileen) Chovanes of Cabot, a niece Elizabeth Gwinn (Jeff) Popovic, and three nephews John Chovanes, Daniel Chovanes, and Steven Stephen. In addition to his parents he is preceded in death by a brother in law Andy Uncapher. Family and Friends will be received for a memorial service on Friday February 8, 2019 from 3:00 pm to 5:00 pm with a Catholic Blessing service at 5:00 pm with Father James Loew OSB at The Janette L. Gamble Funeral Home Inc. 2842 River Road Vandergrift, Pa (724) 567-7006. In lieu of flowers donations may be made to animalprotectors.net. Online condolences may be made at Gamblefh.com. To send flowers or a remembrance gift to the family of Stephen John Chovanes, please visit our Tribute Store. Family and Friends will be received for a memorial service on Friday February 8, 2019 from 3:00 pm to 5:00 pm at The Janette L. Gamble Funeral Home Inc. 2842 River Road Vandergrift, Pa (724) 567-7006. Family and Friends will be received on Friday February 8, 2019 for a Catholic Blessing service at 5:00 pm with Father James Loew OSB at The Janette L. Gamble Funeral Home Inc. 2842 River Road Vandergrift, Pa (724) 567-7006. "Email Address" would like to share the life celebration of Stephen John Chovanes. Click on the "link" to go to share a favorite memory or leave a condolence message for the family.